The fourth house is also the house of our childhood and our parents’ childhood and so-on. It represents the circle of life and size. It’s the house of what makes us into who we are as adults and it’s our past that we like to keep private. This is where we can find “Skeletons in the closet“. It represents resources used to rear us. Do you wonder if you will ever find and own your dream home? 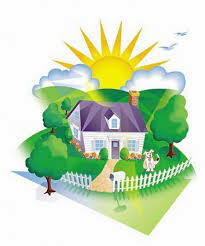 In tarot, there are several cards which refer to property matters and moving house. These are a few cards based on my experience as a reader. A happy scene indeed. This bright card foretells that you are about to set down new roots and you will be more than happy in your new home. Good energy and fabulous neighbors’. What more can you ask for? A card connected with celebrations also, it likely to indicate a house warming party too. This card is often associated with pregnancy and even financial abundance. But I find she also pops up in a reading when someone is about to make a move of house and settle down in a lovely location, more often than not close to the countryside, or even own a house that has a large garden (the Empress is linked to Nature). She does look comfortable too, doesn’t she? So expect to feel this way in your new home. It could be a move that lasts you a life time. Three people stand outside of a property, they are deep in discussion. The discussion could involve changes to the property structure. Work needs to be done. Renovations to be carried out. Yes, a house move will happen. But expect to spend money on improvements and these may not necessarily be what you are aware of at the point of sale. Make sure your budget allows for unforeseen extras. This card can also indicate future expansion of your living space. Adding extra rooms or extending a room.